El Pais is a newspaper in Spain. They did publish PV in there newspaper and now they decided to print books out of this, and other, comic material. 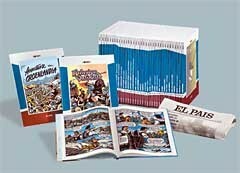 It will be a whole range of books, and two of them (book 11 and 28) are Príncipe Valiente. Book 11 is published in June 2005, book 28 in August 2005. Check this link to read more about it.